In busy Tacloban City, still on the stage of recovery from the havoc few years back, is a new structure in one corner of Burgos Street. 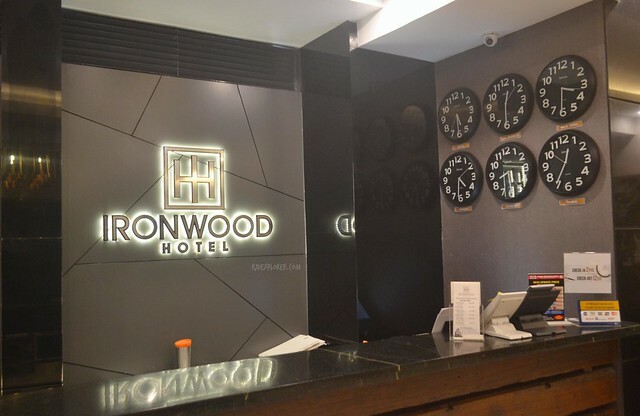 Ironwood Hotel joins the reinforcement in bringing the prior charm and oomph of the city in Eastern Visayas before the devastating super typhoon Haiyan. Despite being new, the hotel is already well-known to people as well as local transports so navigating to the place will be no fret. The irregularly patterned glass panels on the exteriors of the hotel, exposed on the both adjacent sides of the road, make it more prominent and lovable. Clocks of different time zones on Ironwood Hotel’s counter. Scrutinizing the hotel from the outside, I can say that it’s not that wide in terms of lot area but believe me, you will be amazed by how they optimized space in all the floors of the hotel. I arrived at the lobby an hour prior to their standard check-in time and was notified by a front-desk officer that room was still being prepped up. The small yet intimate receiving lounge provided the comforts I was looking for. 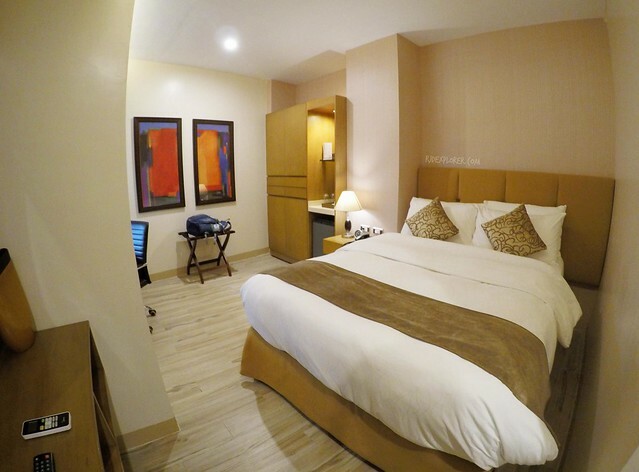 Deluxe Queen for a weekend stay in Tacloban City. While seated on the couch, grabbing some newspapers to get a dose of current events, a staff approached me and immediately offered free Wifi vouchers. After few minutes, I was asked to fill-in the check-in form, and after that, someone accompanied me to my room on the second floor. Right after I settled, someone knocked and by then, a crew from the restaurant handed me a cool refreshing welcome drink. SEED CAFE. 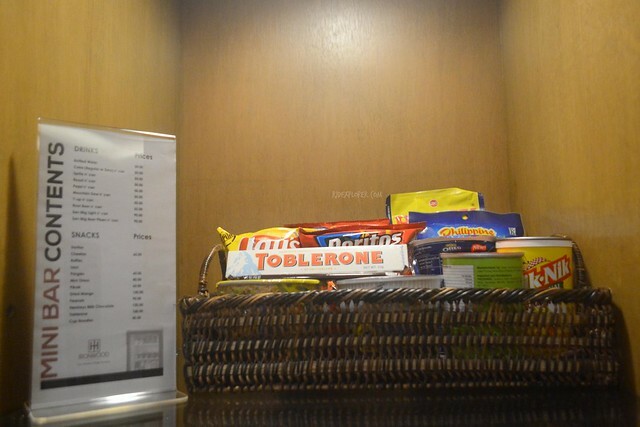 Avail some cakes, chocolate bars, and coffee. This is where I was startled with the smart use of space for the rooms to look large and have a soothing vibe. Floors were covered with wooden tiles; use of earth colors makes the room cozy, soft lighting also adds an intimate mood, and two frames of abstracts on one of the walls; indeed a modern oasis in a summery day. The massive queen-sized bed upholstered by an inviting duvet is the best venue for some quiet reads, or an astounding snooze. Power interruption in the entire city unfortunately disrupted the capabilities of the cable-enabled television. Thanks to that, I was able to recharge by having a power nap, before exploring the landmarks of the city. 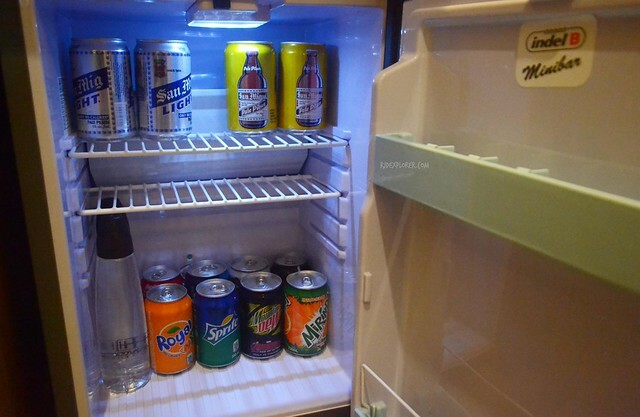 MINI BAR. Chips, noodles, sweets, and canned beverages. 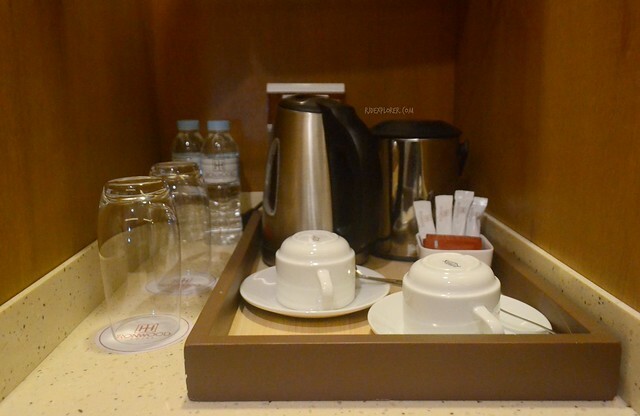 Other room amenities include a work desk, mini bar with chips, noodles, sweets, soda, and beers, coffee and tea making facility, safety deposit box, wardrobe closet, and a stable and fast Wifi connection. Coffee and tea making facility. Ironwood Hotel’s 21 rooms are spread in 6 room types: Deluxe Double, Deluxe Queen, Premium Double, Premium King, Premium Queen, and Executive Suite. The only difference between a Premium and Deluxe is a window view of the city. Complete toiletries and fresh towels were present in the shower equipped with rain-shower and hand-held spouts. Premium Double with a window view of the city. 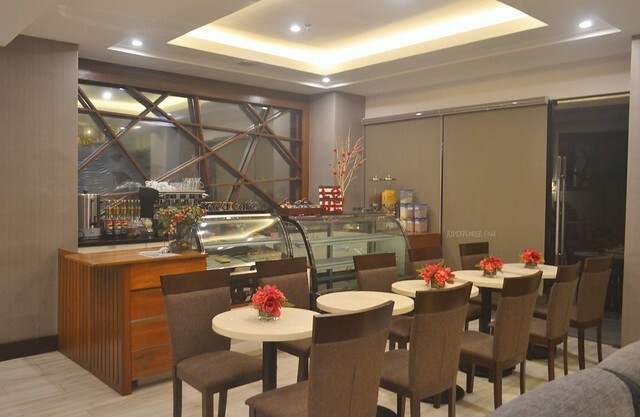 For dining needs, Ironwood Hotel has three outlets: you can indulge in desserts and get a dosage of caffeine in the Seed Café, avail the complimentary breakfast or have savory meals in their all-day dining offerings at Fire Grass Tavern, and chill on the cushioned seats at the Leaf Lounge on the rooftop giving a sweeping view of Tacloban City. TAVERN CAFE for an all-day dining in Ironwood Hotel. 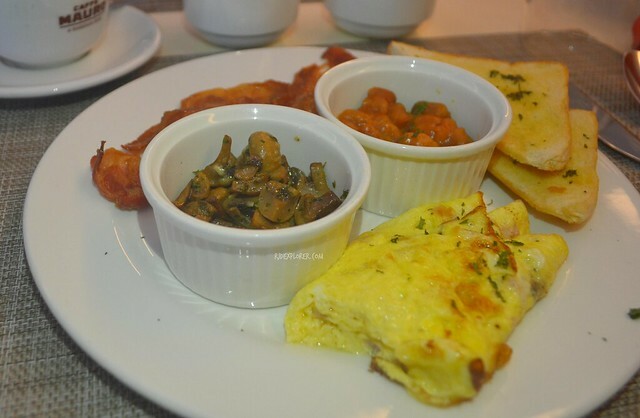 Continental Breakfast with bacon, omelet, sauteed mushroom, beans, and toasted bread. Breakfast is not a buffet but you can choose between a Filipino and Continental plate, the first with the staple rice and the latter with toasted bread. I went for the latter and was served by a plate with bacon, two slices of toasted bread, an omelet, and cups of sautéed mushroom and beans. It was a hearty meal ended by a cup of brewed coffee. 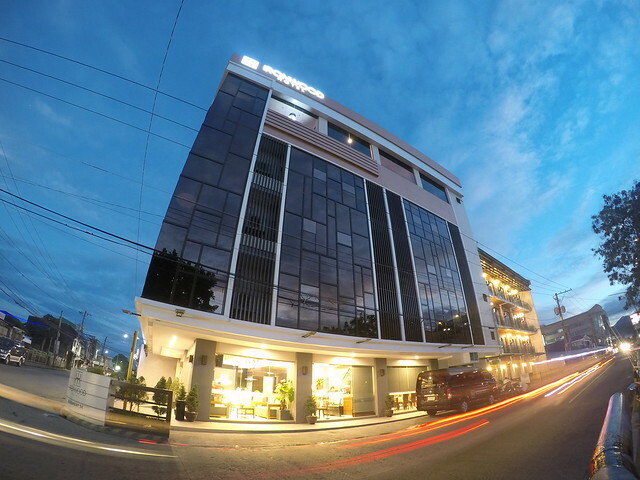 Impressive architecture of Ironwood Hotel graces Tacloban City’s horizon. These amenities and comforts are not only the luxuries that Ironwood Hotel provides. Free shuttle service to and from the airport is very available. 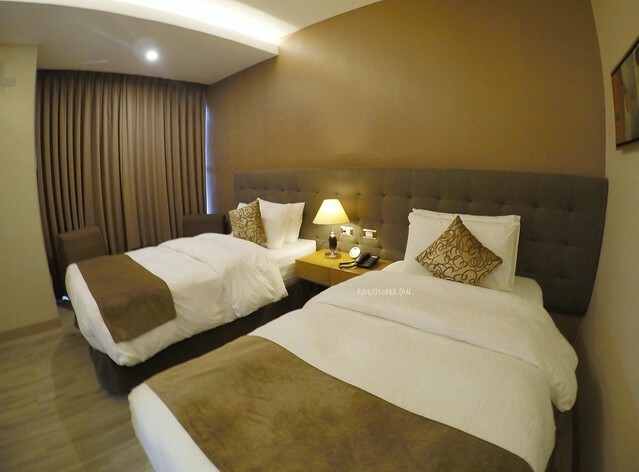 But the best offering that I availed from Ironwood Hotel during my stay is its prime location. The hotel is along Burgos Street where numerous funky and cool restaurants are available, a block away if not. 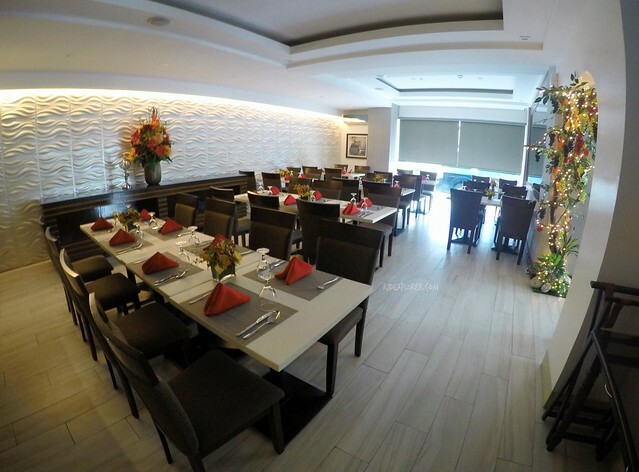 Tacloban’s tourist attractions accessibility from the hotel is also a major addition. 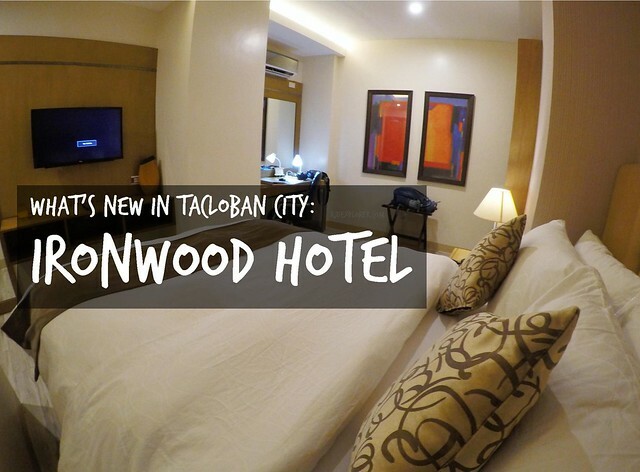 With these points, there is no need for a second option as to where to stay when in Tacloban City; the newly built Ironwood Hotel is the only one on the list. Disclosure: The blogger would like to thank Ironwood Hotel for the 3-day stay last April 2016. The opinions expressed here represent my own and not influenced by the brand.